Enjoy Unzen's nature with your entire body. Only a 20 minute walk from the Unzen hot springs town. 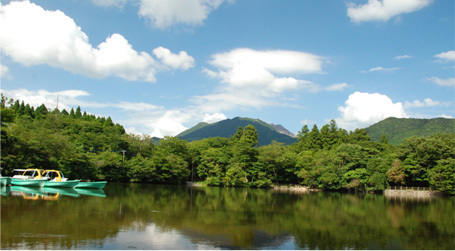 The camping grounds, located near the Shirakumo pond, which has an area of approximately 1 hectare, is surrounded by nature, with plenty of wild birds and insects, and from the lakeside, you can see the Heisei new mountain. In summer, it is cool, making it famous for being the best place to escape the heat. Nearby is Mt. Kinugasa, with only a 30 minute hike to the top. On the way, you may encounter many wild birds, making this the best point for birdwatching. From the top of the mountain, you can see the hot springs town and the mountains of Unzen. 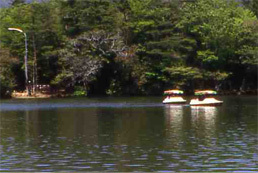 The camping grounds are full of nature, and are naturally cooled. The pleasant breeze coming through the forest amongst the smell of trees, the chirping of birds amidst the quietness, and the blue sky and Heisei new mountain reflecting off the surface of the lake. The camping grounds by the lakeside show off different characteristics as the times change. This is a camping ground embraced by nature, with a comfortable environment.